Make room in your diary for our Festival of Politics event. History of the Potato on Sunday 16 August is not just a highly topical talk by a cutting-edge scientist, but also a multicultural mash-up of potato dishes from around the world. Come hungry and be prepared for surprises as we conjure up sweet, savoury and spicy foods, all made with potatoes. You’ll have had your chips! There is so much more to the potato as the World Kitchen in Leith intends to prove in collaboration with Dr Glenn Bryan of the James Hutton Institute. Glenn, who leads the Potato Genetics and Breeding group at the James Hutton Institute in Dundee, was a member of the international team which cracked the genome of the potato and his research into disease resistance is of increasing global importance in a world of climate change and growing populations. It’s a serious subject of great topical concern but food is also fun (and Glenn’s Twitter name is @potatodoctor). Cooking good meals with fresh ingredients is what interests World Kitchen in Leith. Our cookery demo and tasting session in the Scottish Parliament Members Room will pay tribute to the extraordinary versatility of the edible tuber which has made its way across the world since the Incas of Peru began cultivating it perhaps as long as 10,000 years ago. In Scotland it is eaten boiled, mashed, roast…or, most often, fried as chips. But what about Kenyan potato wraps with tamarind relish, Polish pierogi made with mashed potatoes and cheese, Spanish patatas bravas, Indian spicy potato samosas and, not to be left out, Scottish potato scones with fruity chutney? Mark Whitehead and other members of the WKiL team have put together a selection of dishes so that members of the audience can see, smell and taste how the potato is eaten in many different countries. That will include starters, main course dishes and even a desert, all made with potatoes – if you’ve never thought of potato as a sweet treat then the African potato doughnut will be a revelation. During and after the cookery demo, Glenn will talk about the origins and diversity of the potato, explaining the global significance of his research based at Dundee. Altogether, we think, this is an event for Scotland to be proud of. Look forward to seeing you there. BOOK NOW: from Festival of Politics website. 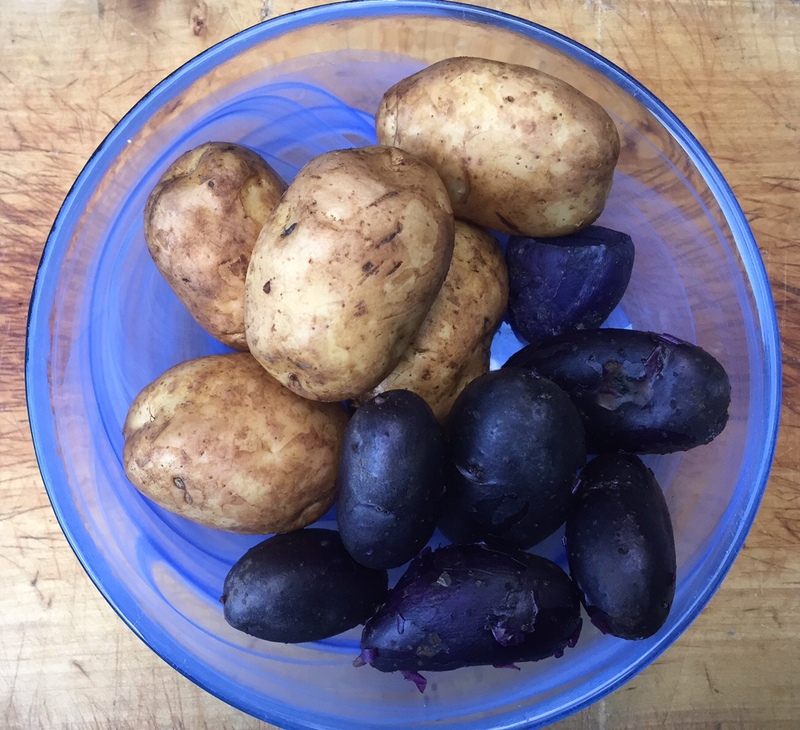 PS: the blue potatoes in the picture at the top are probably Edzell Blue, an old Scottish variety (we will ask the Potato Doctor to confirm that on Sunday) and they come from my small vegetable garden. 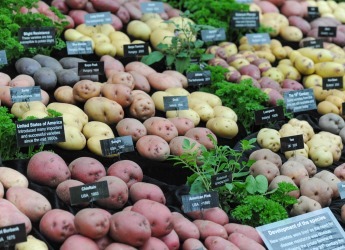 But this display of Scottish potatoes won a gold award at Chelsea Flower show in 2015, the first non-floral display to win the award in the 140 history of the show. The Potato Story, included varieties bred at the James Hutton Institute and from the Commonwealth Potato Collection hosted in Dundee.